I have written an article for online and printed publications and needed some exercise images. I gave the webmaster and editor links to the relevant exercises on your site but they also wants to know if they can reproduce the animated GIFs in the article themselves if they give you credit/acknowledgement? If the pages in which the images will appear will be available to the public or password protected with subscription access. Once you are granted permission, we will require acknowledgements stating "images used with permission from ExRx.net" along with a link to ExRx.net on each page our images appear. Up to 50 images may be used for printed publication or for internet usage at no extra cost with author's permission and purchase. Requires purchase and no additional fee required to publish images in printed publication and on website pages; no permission needed. Cannot publish within software of any kind (web app, desktop application, mobile app, etc). I am a personal trainer from Denmark who really likes your page! I was wondering if it is ok for me to copy the pictures you're using in your page to describe the exercises? My intentions is to illustrate the exercises to my clients. Because I'm doing most of my programs over e-mail. followed by your special instructions. 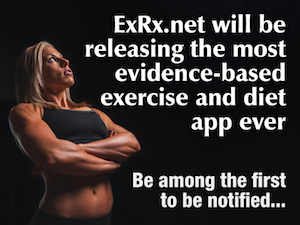 Revenues from our advertisments and online store help maintain ExRx.net and allow further development of our free online resources. We appreciate your support of ExRx.net.